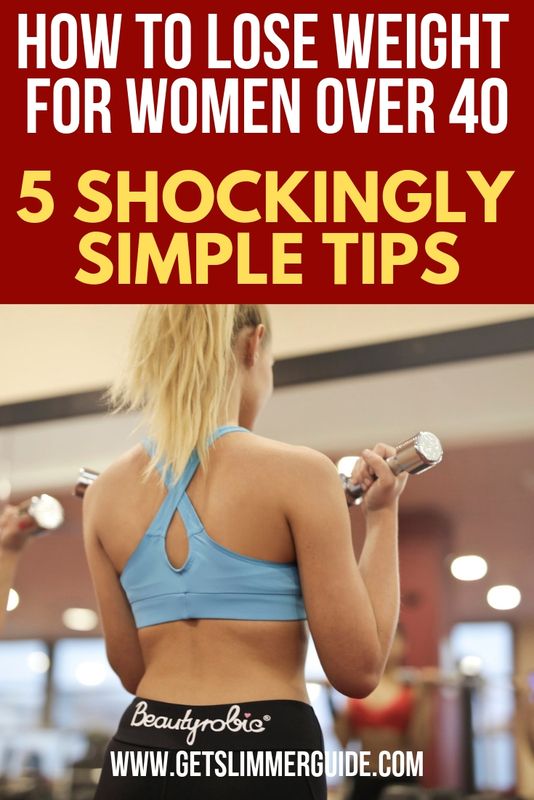 How to Lose Weight for Women Over 40 - 5 Shockingly Easy Tips! 5 Easy Ways to Lose Weight for Women Over 40! Today, we will be discussing tips on how to lose weight for women over 40. For women over 40 who have been struggling to get the weight off, the tips in this article could get you started in the right direction. We know that as we age, our metabolism declines. Our bodies become less efficient at using fuel, and there are hormonal changes that we have to account for, especially for women. It may present unique challenges, but losing weight when you have a few extra years behind you is still a worthy idea. You’ll see the same health benefits that the younger generation sees, in addition to improving the health of your joints, reducing overall inflammation, and still being able to rock yoga pants. Let’s take a look at five of the most helpful tips for weight loss as a woman over 40. Remember that any change great or small begins in your mind. If you begin your weight loss journey believing that you are too old to lose weight, too old to make changes, or are set in your ways, you will be setting yourself up for failure. If you go about your life with the belief that you are capable of anything, that you have goals and you will meet them, then this will become your reality, and you will find the success you are looking for. Those quick fix diets might have worked in your 20s, but you have the experience to know that the weight never stayed off. Now, they have the added detriment of making you feel pretty terrible and draining you of precious energy. You don’t need to deal with fatigue or dehydration, and you know better than to go on a crash diet. As we age, our need for high quality, nutritious food increases, since it’s harder for us to utilize the nutrients in them and more difficult for us to digest in general. Support your body’s natural ability to maintain a healthy weight by making food choices based on freshness and nutrient density. And work on your portion control! “I worked out once, where are my abs?” It’s a tough mentality to break, considering we live in a world of instant gratification. But this is one of the things you can’t expect instant results from. In fact, when you first start your plan, you may feel worse for a few days or a week as you adjust to better food choices and muscle soreness. Stick with it. It helps to keep yourself busy and not focus so much on the ultimate goal, instead focusing on smaller goals like how many times you work out per week or how many vegetables you integrate into your diet. It also helps to reduce the number of times you weigh yourself. Don’t jump on the scale every morning, that could make you crazy. Instead, choose one day a week, or every two weeks to log your progress. Switching out your noodles for zucchini or cabbage, or making pizza with cauliflower as the crust are just two easy examples of small changes you can make. You can still have all the foods you enjoy and eat all the comfort foods you’re accustomed to, but you can make them into healthier options with these kinds of ingredient substitutions. There are quite a few websites that will give you healthier versions of your favorite recipes, or provide substitution ideas that will lower your calorie intake while still giving you satisfying meals. Are you a fan of broccoli and cabbage? These are two of the best foods to support your hormone balance. They’re also high in nutrients and low in calories, making them perfect for your way of eating. Fatty fish is high in Omega-3 fatty acids and DHEA, plus plenty of protein that we often skip out on. Avoid sticky, starchy, sugary foods, since these can spike insulin and signal your body to store excess calories instead of letting them be burned or eliminated. Limit the amount of alcohol and caffeine you consume, as these can act as hormone disruptors. Focus on clean water, and teas. Green tea is especially helpful for burning fat regardless of your age, and there are several herbal blends that focus specifically on female hormone balance. Eat soy products with caution. Soy may act as a hormone disruptor, so before you fill your fridge and freezer with soy-based everything, see how you react to it for a couple of weeks and adjust accordingly. Studies have shown that exercising with weights and other types of resistance training improves metabolism, bone density, flexibility, and reduces age-related muscle loss. Weight-bearing exercise can improve the overall quality of life since it keeps the body functioning to a higher degree for a longer time. The important part of this for working to lose weight is that it keeps the muscles robust and strong, which leads to an overall greater number of calories burned, even beyond the time of the workout. This is especially important after 40, because our metabolisms tend to slow down. This is an essential boost to keeping your weight under control. An excellent reference for these benefits can be found in this study, which also reminds us to avoid high impact sports or activities where falling is a significant risk. Losing weight can be hard and it gets even harder as you get older. This is because as we get older, our metabolism slows down, which impacts negatively on our efforts to lose weight. However, if you stick with it and keep going, you will surely see results. I suggest you view your weight loss journey as a marathon instead of a sprint. Slow and steady WINS the race. Having this perspective will help you to NOT burn out or get discouraged. Take it one day at a time and before long you will begin to see the pounds come off! Did you find the tips on how to lose weight for women over 40 helpful? Feel free to share your thoughts in the comment section below.